Not to be confused with Emoxypine. Amoxapine, sold under the brand name Asendin among others, is a tricyclic antidepressant (TCA). It is the N-demethylated metabolite of loxapine. Amoxapine first received marketing approval in the United States in 1992 (approximately 30 to 40 years after most of the other TCAs were introduced in the United States). Amoxapine is used in the treatment of major depressive disorder. Compared to other antidepressants it is believed to have a faster onset of action, with therapeutic effects seen within four to seven days. In excess of 80% of patients that do respond to amoxapine are reported to respond within a fortnight of the beginning of treatment. It also has properties similar to those of the atypical antipsychotics, and may behave as one and may be used in the treatment of schizophrenia off-label. Despite its apparent lack of extrapyramidal side effects in patients with schizophrenia it has been found to exacerbate motor symptoms in patients with Parkinson's disease and psychosis. It tends to produce less anticholinergic effects, sedation and weight gain than some of the earlier TCAs (e.g. amitriptyline, clomipramine, doxepin, imipramine, trimipramine). It may also be less cardiotoxic than its predecessors. It is considered particularly toxic in overdose, with a high rate of renal failure (which usually takes 2–5 days), rhabdomyolysis, coma, seizures and even status epilepticus. Some believe it to be less cardiotoxic than other TCAs in overdose, although reports of cardiotoxic overdoses have been made. ^ a b "Amoxapine: Indications, Side Effects, Warnings -Drugs.com". Drugs.com. Drugs.com. 6 November 2013. Retrieved 26 November 2013. ^ a b Kinney, JL; Evans, RL (September – October 1982). "Evaluation of amoxapine". Clinical Pharmacy. 1 (5): 417–24. PMID 6764165. ^ a b c d Amoxapine. Martindale: The Complete Drug Reference. London, UK: Pharmaceutical Press. 30 January 2013. Retrieved 26 November 2013. ^ Ban, TA; Fujimori, M; Petrie, WM; Ragheb, M; Wilson, WH (1982). "Systematic studies with amoxapine, a new antidepressant". International Pharmacopsychiatry. 17 (1): 18–27. PMID 7045016. ^ a b Cohen, BM; Harris, PQ; Altesman, RI; Cole, JO (September 1982). 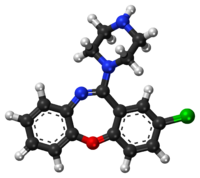 "Amoxapine: neuroleptic as well as antidepressant?". The American Journal of Psychiatry. 139 (9): 1165–7. doi:10.1176/ajp.139.9.1165. PMID 6126130. ^ Kapur, S; Cho, R; Jones, C; McKay, G; Zipursky, RB (May 1999). "Is amoxapine an atypical antipsychotic? positron-emission tomography investigation of its dopamine2 and serotonin2 occupancy". Biological Psychiatry. 45 (9): 1217–1220. doi:10.1016/S0006-3223(98)00204-2. PMID 10331115. ^ Wadenberg, M-LG; Sills, TL; Fletcher, PJ; Kapur, S (April 2000). "Antipsychoticlike effects of amoxapine, without catalepsy, using the prepulse inhibition of the acoustic startle reflex test in rats". Biological Psychiatry. 47 (7): 670–676. doi:10.1016/S0006-3223(99)00267-X. PMID 10745061. ^ Apiquian, R; Fresan, A; Ulloa, RE; de la Fuente-Sandoval, C; Herrera-Estrella, M; Vazquez, A; Nicolini, H; Kapur, S (December 2005). "Amoxapine as an atypical antipsychotic: a comparative study vs risperidone". Neuropsychopharmacology. 30 (12): 2236–2244. doi:10.1038/sj.npp.1300796. PMID 15956984. ^ Chaudhry, IB; Husain, N; Khan, S; Badshah, S; Deakin, B; Kapur, S (December 2007). "Amoxapine as an Antipsychotic: Comparative Study Versus Haloperidol". Journal of Clinical Psychopharmacology. 27 (6): 575–581. doi:10.1097/jcp.0b013e31815a4424. PMID 18004123. ^ Sa, DS; Kapur, S; Lang, AE (July – August 2001). "Amoxapine Shows an Antipsychotic Effect but Worsens Motor Function in Patients with Parkinson's Disease and Psychosis". Clinical Neuropharmacology. 24 (4): 242–244. doi:10.1097/00002826-200107000-00010. PMID 11479398. ^ Gelenberg, AJ; Cooper, DS; Doller, JC; Maloof, F (October 1979). "Galactorrhea and Hyperprolactinemia Associated With Amoxapine Therapy". JAMA. 242 (17): 1900–1901. doi:10.1001/jama.1979.03300170046029. PMID 573343. ^ a b Walker, R; Whittlesea, C, eds. (2007) . Clinical Pharmacy and Therapeutics (4th ed.). Edinburgh: Churchill Livingstone Elsevier. ISBN 978-0-7020-4293-5. ^ White, Nicole C.; Litovitz, Toby; Clancy, Cathleen (December 2008). "Suicidal antidepressant overdoses: a comparative analysis by antidepressant type". Journal of Medical Toxicology. 4 (4): 238–250. doi:10.1007/BF03161207. PMC 3550116. PMID 19031375. ^ a b c d Seeman P, Tallerico T (1998). "Antipsychotic drugs which elicit little or no parkinsonism bind more loosely than dopamine to brain D2 receptors, yet occupy high levels of these receptors". Mol. Psychiatry. 3 (2): 123–34. doi:10.1038/sj.mp.4000336. PMID 9577836. ^ a b c d e Roth BL, Craigo SC, Choudhary MS, et al. (1994). "Binding of typical and atypical antipsychotic agents to 5-hydroxytryptamine-6 and 5-hydroxytryptamine-7 receptors". J. Pharmacol. Exp. Ther. 268 (3): 1403–10. PMID 7908055. ^ Kohen R, Metcalf MA, Khan N, et al. (1996). "Cloning, characterization, and chromosomal localization of a human 5-HT6 serotonin receptor". J. Neurochem. 66 (1): 47–56. doi:10.1046/j.1471-4159.1996.66010047.x. PMID 8522988. ^ a b c d e f g h i j Richelson E, Nelson A (1984). "Antagonism by antidepressants of neurotransmitter receptors of normal human brain in vitro". J. Pharmacol. Exp. Ther. 230 (1): 94–102. PMID 6086881. ^ a b c Burstein ES, Ma J, Wong S, et al. (2005). "Intrinsic efficacy of antipsychotics at human D2, D3, and D4 dopamine receptors: identification of the clozapine metabolite N-desmethylclozapine as a D2/D3 partial agonist". J. Pharmacol. Exp. Ther. 315 (3): 1278–87. doi:10.1124/jpet.105.092155. PMID 16135699. ^ a b c Appl H, Holzammer T, Dove S, Haen E, Strasser A, Seifert R (2012). "Interactions of recombinant human histamine H₁R, H₂R, H₃R, and H₄R receptors with 34 antidepressants and antipsychotics". Naunyn Schmiedebergs Arch. Pharmacol. 385 (2): 145–70. doi:10.1007/s00210-011-0704-0. PMID 22033803. ^ a b Pälvimäki EP, Roth BL, Majasuo H, et al. (August 1996). "Interactions of selective serotonin reuptake inhibitors with the serotonin 5-HT2c receptor". Psychopharmacology. 126 (3): 234–40. doi:10.1007/BF02246453. PMID 8876023. ^ Glusa E, Pertz HH (June 2000). "Further evidence that 5-HT-induced relaxation of pig pulmonary artery is mediated by endothelial 5-HT2B receptors". British Journal of Pharmacology. 130 (3): 692–8. doi:10.1038/sj.bjp.0703341. PMC 1572101. PMID 10821800. ^ a b c Gozlan H, Saddiki-Traki F, Merahi N, Laguzzi R, Hamon M (December 1991). "[Preclinical pharmacology of amoxapine and amitriptyline. Implications of serotoninergic and opiodergic systems in their central effect in rats]". L'Encéphale (in French). 17 Spec No 3: 415–22. PMID 1666997. ^ a b c Wei HB, Niu XY (1990). "[Comparison of the affinities of amoxapine and loxapine for various receptors in rat brain and the receptor down-regulation after chronic administration]". Yao Xue Xue Bao = Acta Pharmaceutica Sinica (in Chinese). 25 (12): 881–5. PMID 1966571. ^ Lim HD, van Rijn RM, Ling P, Bakker RA, Thurmond RL, Leurs R (September 2005). "Evaluation of histamine H1-, H2-, and H3-receptor ligands at the human histamine H4 receptor: identification of 4-methylhistamine as the first potent and selective H4 receptor agonist". The Journal of Pharmacology and Experimental Therapeutics. 314 (3): 1310–21. doi:10.1124/jpet.105.087965. PMID 15947036. ^ Harald Sitte; Michael Freissmuth (2 August 2006). Neurotransmitter Transporters. Springer Science & Business Media. pp. 472–. ISBN 978-3-540-29784-0. ^ Onali P, Dedoni S, Olianas MC (January 2010). "Direct agonist activity of tricyclic antidepressants at distinct opioid receptor subtypes". J. Pharmacol. Exp. Ther. 332 (1): 255–65. doi:10.1124/jpet.109.159939. PMID 19828880. ^ Midha KK, Hubbard JW, McKay G, Rawson MJ, Hsia D (September 1999). "The role of metabolites in a bioequivalence study II: amoxapine, 7-hydroxyamoxapine, and 8-hydroxyamoxapine". International Journal of Clinical Pharmacology and Therapeutics. 37 (9): 428–38. PMID 10507241. ^ a b Jue, SG; Dawson, GW; Brogden, RN (July 1982). "Amoxapine: A Review of its Pharmacology and Efficacy in Depressed States". Drugs. 24 (1): 1–23. doi:10.2165/00003495-198224010-00001. PMID 7049659. ^ Calvo, B; García, MJ; Pedraz, JL; Mariño, EL; Domínguez-Gil, A (April 1985). "Pharmacokinetics of amoxapine and its active metabolites". International Journal of Clinical Pharmacology, Therapy, and Toxicology. 23 (4): 180–185. PMID 3997304. ^ Takeuchi, H; Yokota, S; Shimada, S; Ohtani, Y; Miura, S; Kubo, H (April 1993). "Pharmacokinetics of amoxapine and its active metabolites in healthy subjects". Current Therapeutic Research. 53 (4): 427–434. doi:10.1016/S0011-393X(05)80202-4. This page was last edited on 17 March 2019, at 10:26 (UTC).